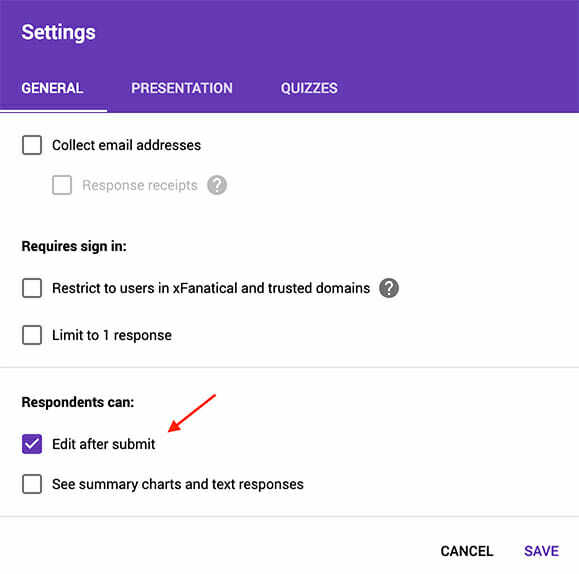 How to Edit Google Forms Responses in the Spreadsheet? Form owners may need edit a few form responses in the spreadsheet to correct some information. This topic seems rippling over and over again for years but Google still doesn’t support the feature. We used to think that by editing the cells in the linked spreadsheet, these responses will change too. But unfortunately it doesn’t. To edit the real responses, you need a link called Form Response Edit URL. This tutorial shows you how an apps script xfanatical built can allow you edit form responses directly in spreadsheet. You have a spreadsheet connected with the form as a response destination. You have enabled Respondents can Edit after submit option in the Settings of form. 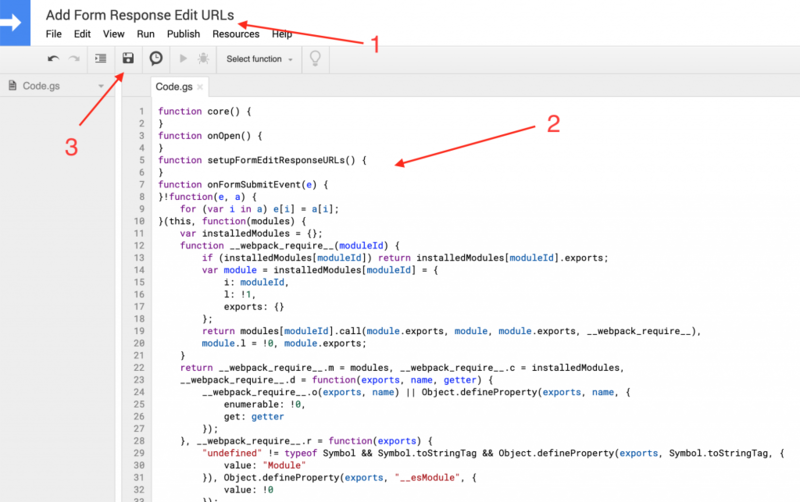 Download the Add Form Edit Response URL apps script. 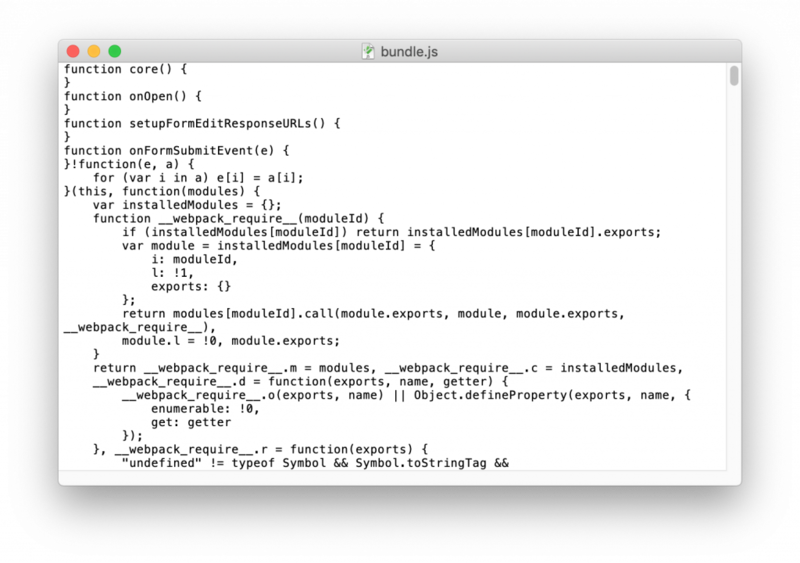 Copy all the content of bundle.js to your clipboard. Now open up the spreadsheet with which the form is associated. Click Tools in the menu bar, followed by Script editor. Paste the code from Step 1. Now go back to Spreadsheet tab. Refresh the page. You will see a new Menu Forms > Add Form Response Edit URLs by the end of menu bar. It’s tiring of setting up all the pieces, isn’t it? I know, it’s boring to handle technical issues sometimes. But we’re almost there. Click that Add Form Edit Response URLs menu. Wait for the script running. If the Authorization window popups, don’t panic, just go through it. The Apps Script is safe. You will see the script adds a new column Form Response Edit URL. It then adds one-by-one the urls to the responses. Amazing, huh? BONUS: Now ask your respondent to submit a new response. The Form Response Edit URL will be automatically attached to Spreadsheet for the new response! Step 4. Edit responses in the spreadsheet! Now you have a response edit url for every submission, you are free to click those links and make changes to them. The changes will be reflected soon in the spreadsheet. How to Print All Options in a Drop-down List in Google Sheets? How to Create Ranked Choices in Google Forms? How to Add an Apps Script to your Google Docs?